Hello stampers. There should always be time for tea! I have great memories of drinking tea with my mother. You see in many typical Dutch households, you start the day with tea and breakfast. Coffee doesn’t happen until 10am. That is official coffee time. Tea also happened again in the evening around 8pm. Tea was also served in pretty tea cups, not clunky mugs as my mom considered them. Even though I am 100% Canadian, with Dutch roots some of these traditions stick. That’s why this time for tea set really appealed to me. Daytripping with girlfriends should also include a charming tea room. There is a great tea room about an hour away from me in Kingsville called Annabelle’s. A day trip there just feels like a vacation. There is something about drinking fragrant tea from a pretty china tea cup that turns the moment into an occasion to be savoured. The cards that I am showcasing in this blog post have by and large been inspired by my fellow demonstrators. I think there is only one “Jackie original” in there and I can’t say that I am totally in love with it. Sometimes it is just so wonderful to be able to use the creativity of other people. Create, inspire, share. That is what it is all about. The first card that I made was totally cased from Kristi Gray, a talented demonstrator from Washington State. I loved the colours that she used and the layout…actually everything about it is just beautiful. the Spot of Tea framelits that come in this suite are terrific. What’s especially nice is that there are two of the flowers and two of the floral swags so that you can cut out two at a time. That is a real time saver! You can find Kristi’s blog post here. Here is a closeup of the lovely detail in this card, the ribbon in this suite is exquisite, the metallic edge is just so shimmery, even the picture captures it which is rare! The next card really captures the feel of a vintage tea room and it was designed by my dear friend Shelly Godby. It uses calypso coral and coastal cabana and more of the lovely coordinating paper called Tea Room Specialty designer series paper as well as the tea room ribbon. 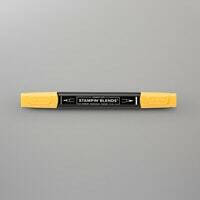 It’s so handy that you can purchase a package of coordinating cardstock so that you get 8 each of three matching colours: calypso coral, coastal cabana and thick very vanilla. That saves you from buying three individual packs. Here is the link to Shelly’s blog. My next card has a really neat fold. I wish I knew whose card I cased to make this but I can’t find it any more. If it is you, please take credit! This card is coastal cabana and crumb cake and has a real mellow vibe. The next card uses the Tufted embossing folder. Everyone who uses this folder orders it. The effect is just amazing. What do you think? This card also uses the colour palette of crushed curry and coastal cabana. 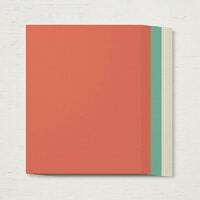 These colours are also found in the coordinating designer series paper in this suite. The suite makes it so easy to make beautiful cards without having to think too much about it. Once again, this card has been cased from somewhere online!! I coloured the pearls using my daffodil delight Blends. The first four cards shown thus far will be featured in my Time for Tea class on Saturday at 1pm. It is part of a new series of classes called Sweet Suite Saturdays. You can either pay $20 for the class or get it for free if you order the Time for Tea bundle. Now I’m not sure I like this card. I think the white edge is a bit much, but I thought I would share it anyways so you can see that not everything I make is all that wonderful. I also messed up a bit on the stamping under the butterfly. 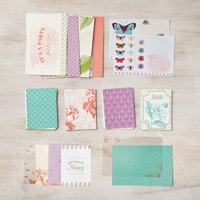 The butterfly is a sticker that comes in the Tea Room Memories and More card pack. If you rub your embossing buddy over the back of it that removes the stickiness so that you can bend the wings forward to give it a 3D look. I used a copper vinyl sticker along the inside edge of the card for added interest. This card was also cased from someone, but I changed it up by inking up the polka dot ribbon and by stamping the tea cup on patterned paper before cutting it out with the matching framelit. I love this colour combination! The pearls were coloured with a dark daffodil delight Blends. I love this monochromatic card. All those lovely flowers are part of the bundle too as well as the copper vinyl sticker on that pretty detailed circle. Are you falling in love with this suite yet? I wish I knew whose card this was! 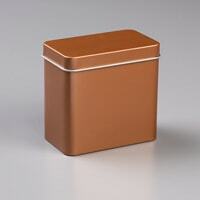 The last thing I want to share is a pretty copper tea tin. And, yes, they are also part of this charming suite. You can get a set of four tins for only $20. 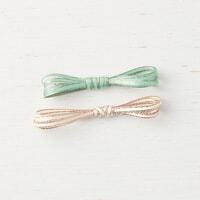 They would make such an adorable gift along with a coordinating card. 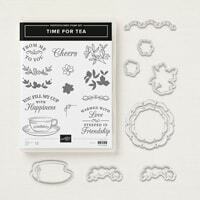 On this tea tin you can see the other ribbon that comes in the Tea Room ribbon combo pack. You get two spools of ribbon with five yards on each spool for $11. It really has such a beautiful copper edge to it and it ties like a dream! I hope that this blog post has shown you the versatility of this beautiful suite of products. If you live near Chatham you might want to come to my Saturday afternoon class at 1pm and make some of these great cards. If you decide to come, please do let me know. Online orders are always greatly appreciated! 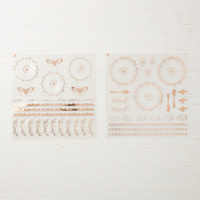 If you order the bundle I will send you the tea room copper vinyl stickers in the mail! Just click on any of the items in the product list below and you will be taken directly to my online store. If possible please use the current host code when you order: H6JA44TT. As always, if you find that your wish list is long and you want it all, the best deal ever is the starter kit. You get bonus products (you pay only $135 but you get to pick out $165 in product) you pay no shipping and no tax and you get a 20% discount on any subsequent orders. If you want to keep your discount and your demonstrator status you are required to buy or sell $400 in your first full quarter (three months) but if you don’t there are no dire consequences. Give it a try! Click here to take advantage of that offer. Have a super day and happy stamping!